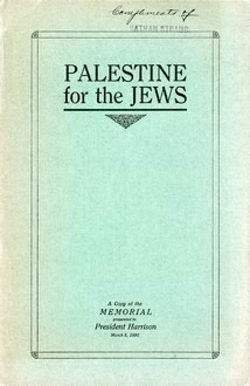 The Blackstone Memorial, 1891: " Palestine for the Jews." Zionism may be a supremely well-studied movement, but its Christian dimension remains surprisingly obscure. Take the starting date of Merkley's brisk and informative study, 1891: it refers to the "Blackstone Memorial," a petition addressed to the president of the United States, Benjamin Harrison, and the secretary of state James G. Blaine, to "use their good offices and influence ... to secure the holding at an early date of an international conference to consider the condition of the Israelites and their claims to Palestine as their ancient home." This unabashed expression of Christian Zionism was signed by 413 prominent Americans, including the chief justice of the Supreme Court, the speaker of the House, the greatest industrialists of the day (Rockefeller, Morgan, McCormick), famous clergymen, writers, and journalists. The president promised to give it "careful attention"; and though he did nothing of the sort, Merkley credits the now-forgotten memorial, Palestine for the Jews, with "firmly planting in many minds" the "notion of American sponsorship of a Jewish return to Palestine." The author dwells on other lost personalities and episodes. 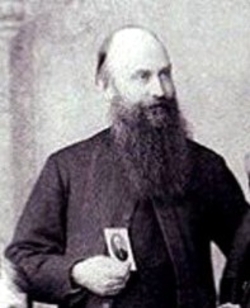 William Hechler (1845-1931), a British clergyman and ally of Herzl. He tells about William Hechler, a British clergyman who dropped in on Theodor Herzl just days after Herzl's book, The Jewish State, appeared in 1896, announcing "Here I am." To this, Herzl laconically replied, "That I can see, but who are you?" Despite this inauspicious start, Hechler's devotion to Zionism and his highly-placed connections won Herzl audiences with the German leadership, including with the kaiser himself. In these and many other colorful stories, Merkley shows that today's Christian Zionists draw on a history going back a century-plus; and that their internal differences (over such matters as the need or not to convert the Jews) and the divided Jewish responses (whether to welcome or mistrust their help) also have a long pedigree. July 15, 2003 update: I expand on this theme today in the New York Post at "[Christian Zionism:] Israel's Best Weapon?"